For my birthday this week, I got a few knitting pretties! First, I got a gift card & I purchased 2-at-a-Time Socks by Melissa Morgan Oakes. Because of my “Short Attention Span Theater” (also known as ADD), I’ve never been much of a sock knitter, but I do enjoy them, and knitting two at once is a stroke of genius for ADDers like me! I’m looking forward to checking out her companion tome, Toe-Up 2-at-a-Time Socks. My Double Crossing Diamonds Aran* is back on track (thanks, Doc! 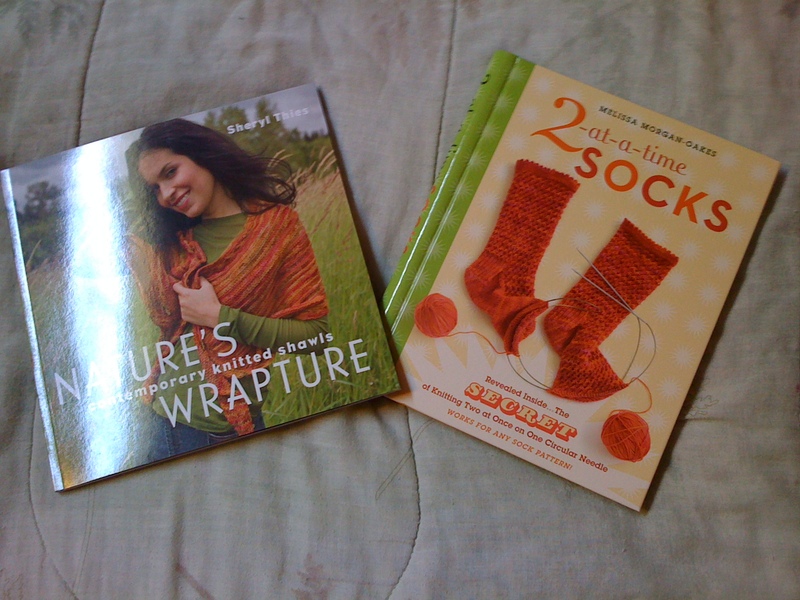 ), and we think the book screwed up, not I, with the Jewel-Tone Wrap*, so much knitting awaits! Previous PostClapotisNext PostShhhh…It’s a Secret!